Pictured: Kymberly Mellen and Philip Earl Johnson. Photo by Johnny Knight. Russia. The media. An arrogant patriot. A closeted WASP. Heavily biased journalism. These factors alone are not enough to make this story engaging or relevant today. Joseph Alsop (Philip Earl Johnson), our journalist protagonist, as a character draws similarities to Kushner’s’ Roy Cohn, but is not pathetically endearing or despicably hypocritical or even conflicted enough to hold the fascination that Kushner’s’ depiction of Roy creates. There is little urgency for this character and nothing particularly captivating about him. To be fair, the actors are dealt some really unfulfilling plot points that this production doesn’t solve. For example, the opening scene of entrapment goes nowhere and seems to have limited impact on the protagonist. For a moment he is stung by the betrayal, but even his vengeance dissipates; when what promised to be an engaging newspaper column, never materializes. This seems to be a trend throughout the production, giving it a feel of an Ancient Greek tragedy albeit without the tragic conclusion. All the action happens off stage or in between the scenes. 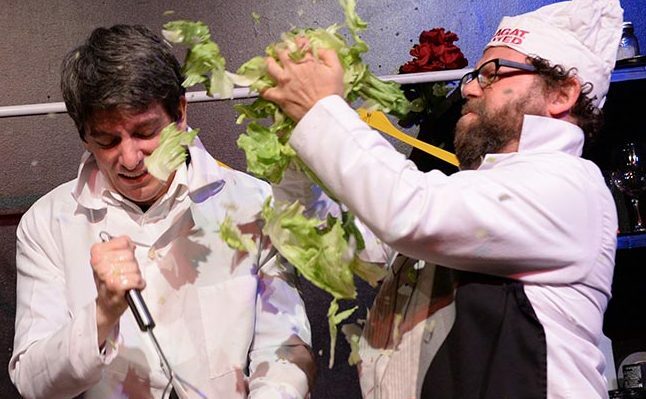 However, unlike Greek tragedy, no one comes on stage to deliver a harrowing account of what happened. I found myself only catching up on what had happened off stage well into the next scene. Simple directorial fixes could have helped the audience make these leaps. It’s the supporting characters journeys that seemed to warrant more stage time. Abigail (Tyler Meredith), Alsop’s stepdaughter, is instantly transformed from precocious elite schoolgirl to rebellious freedom fighting hippie. It’s a shame we never learn how or why. There is also a missed opportunity for some tension due to this change with her patriotic stepfather. Coburn Goss as Stewart Alsop brings some real heart to the play in a finely measured performance as the overshadowed yet protective brother of the bullying sycophant. It’s a character that could have warranted his own story but sadly gets very little action to play. 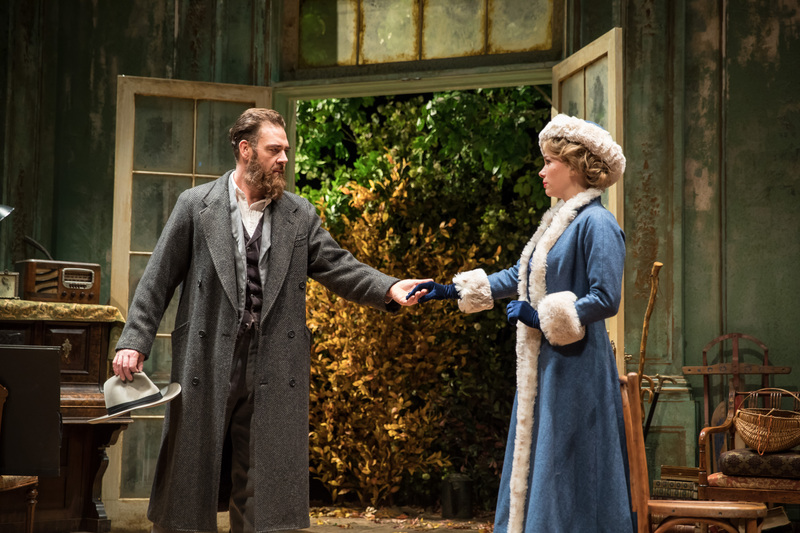 Kymberly Mellen is delightful as Susan Mary Alsop, the lonely socialite “beard” for Joe, but doesn’t have much to work with. There is, however, a nuanced scene between these two that reveals some sexual subtext that perhaps could do with some foreshadowing in earlier scenes. 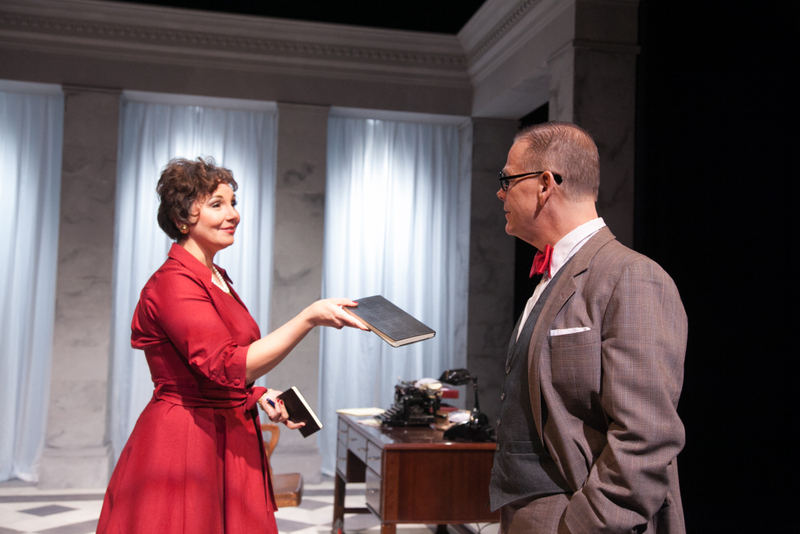 Smooth transitions were aided by a smart choice to keep one character on stage during the furniture movements to continue an audience’s’ cerebral investment in these characters. I just wish this choice were utilized more consistently or effectively —Stewart’s’ departure just seemed functional rather than a metaphor for a larger journey. Christopher Neville’s costume design puts Susan into some beautifully refined costumes, giving her an effortless flair and there is some nice dialect work by Eva Breneman. The lighting design, however, added very little to the production and at times was distracting. Red lights on the apartment curtains were to somehow indicate that the newly inaugurated president was visiting (I figured that out five minutes into the next scene). The set design creates an effectively cold and stuffy world but only highlights how removed from relevance this play is from current events. THE COLUMNIST runs through April 1st. For more information visit americanbluestheater.com. 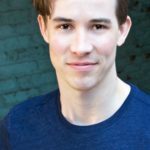 An MFA graduate from Roosevelt University, Jude has worked w/ Redmoon Theatre, The House Theatre, The New Colony, & Kid Brooklyn Productions, to name a few. Before moving to the States from Australia, Jude was a founding member & artistic director of Placenta Theatre, recipient of Best Director two years running at Midsumma Theatre Festival, & recipient of the Australian National Young Playwrights Award. He is represented by Shirley Hamilton & currently working on writing a comedic television series.